January is usually the weakest month of the year for new housing loans but this year, the volume of new loans was almost 30% below the level of January 2018 and represented the lowest monthly volume of housing loans since January 2016. The double-digit fall has continued for a second month in a row and has even intensified compared to December last year (-23% YoY). However, weak credit activity in the last two months was, to a large extent, likely driven by substantial frontloading of mortgage loans in the second half of last year when households were eager to obtain a loan before new, stricter CNB macroprudential recommendations on income limits came into force (no higher loan than a multiple of nine of net annual salary and monthly instalments above 45% of the net monthly income of the credit applicant). This means that it wasn't just the stricter central bank recommendations and higher mortgages interest rates that contributed to the weaker prints. The frontloading effect will diminish in the coming months, which should also reduce the year-on-year decline in newly granted loans. Nevertheless, it seems likely that the volume of new housing loans will be at least 10% lower this year than in the record-high 2018, in our view. For the whole of 2018, the volume of new housing loans provided by banks was CZK 232 billion. 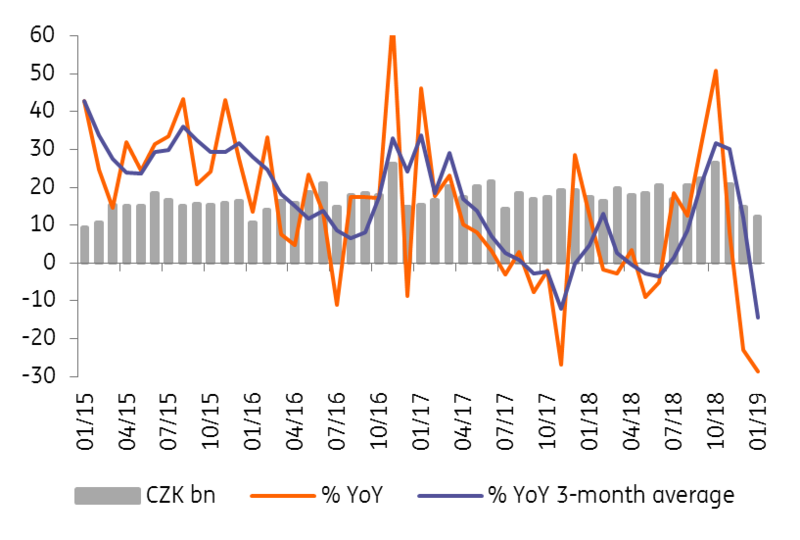 With an expected 10% year-on-year decline this year, around CZK 23 billion of credit will be missing from the economy. This represents 0.4% of GDP, which will also be one reason behind the growth slowdown this year. More importantly, this estimate is based on a “less severe” impact on the credit market from the CNB measures, as some market players predict an even stronger 20-30% YoY fall in new credit loans this year (due to CNB macroprudential measures but also relatively high property prices and higher interest rates). In such a strong decline, however, the CNB could relax its recommendations slightly, in our view, though the CNB has not yet signalled any pain threshold.